Ordinarily I give my own run down of the synopsis of the book but in this case I chose not to. 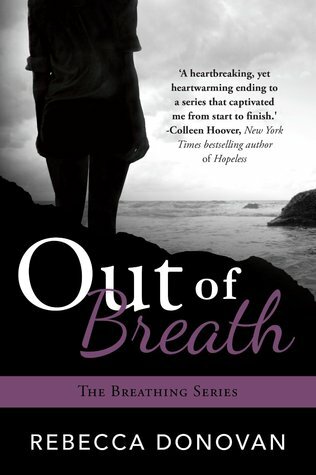 Out of Breath is the final book in the Breathing trilogy by the hugely talented Rebecca Donovan. As the third book I felt that if I were to give my own version of the story I would risk not only giving away too many spoilers but ruining the whole trilogy for those who have not yet started it. I didn’t review the first two books; Reason to Breathe and Barely Breathing as I was a little late to the party. I found them with thanks to another blog, way back when it hadn’t crossed my mind to start one. I actually found quite a lot of my books on there and I owe a debt of thanks to Maryse as without her I wouldn’t have found all these fabulous authors! So thank you Maryse, you rocked my reading world! The first book, Barely Breathing is without a doubt the most intense book I have ever read, I found myself holding my breath while flipping through the pages, I think I may even have broke into a sweat during parts. You tend to forget that it is fiction and get engrossed in the storyline. For this reason alone I am glad I was late to the party as I just went straight into the second book. Again this book was intense but for different reasons. I found myself screaming at the books and almost in fear of what Emma was going to do. Did she not realise that Evan was the one for her? How could she get so close to Jonathan. Oh hear I’m getting all worked up again. As I said Rebecca Donovan is a seriously talented lady. What a way to end book 2 and what a way to kill us! I have been waiting around 8 months for the final instalment but there are many out there that waited a lot longer so I should be grateful. I got the book as soon as I could on Monday and tried and failed miserably to read with the kids running rings round me. Bedtime couldn’t come quick enough. I started Monday night and finished Tuesday night. WOW. While to me, the first book will always be the best the third and final book was nothing short of spectacular. No stone was left unturned, no questions were left unanswered. For the first couple of chapters I found it hard to place certain events, I could have easily read the first two books again as a refresher but I didn’t think of it before release day and there was no way I could wait. I thought going into it that it would be lacking something, it couldn’t possibly be as good as the other two. Once however I got back the feel for the characters I was transported straight back into the lives of Emma and Evan. There were enough reminders throughout the book to jog your memory of events while at the same time they weren’t in your face repetitions, just nice subtle hints dropped here and there. I rushed through reading Out of Breath and then come the end of it I was sad it was over. It was a great end to the story that has had many people gripped since 2011. Not everything in life runs smoothly and not everyone has an easy path to follow and I think it is important that our reading reflects this! Well done Rebecca, I cant wait to see what is next! I would just like to add that I ALMOST got through a whole book without crying. I did I swear. Then I read the acknowledgements and I found myself crying! They really are lovely. Sounds fantastic. Can’t wait to start this trilogy!